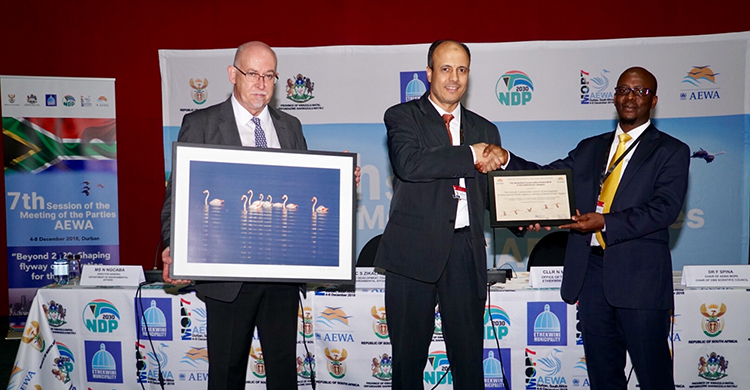 Durban, 4 December 2018 - Today, the Nature Conservation Sector (NCS) of the Egyptian Environmental Affairs Agency, Ministry of Environment, was declared the winner of the AEWA Conservation Award. The Conservation Award for the institutional category has been presented at the opening ceremony of the 7th Meeting of the Parties in Durban, South Africa. The Egyptian Environmental Affairs Agency is the national authority responsible for implementing AEWA in Egypt. Its Nature Conservation Sector (NCS) has a strong focus on wetlands and their resources. In a move to preserve and manage them, the Agency launched a programme in 2016 to save the country’s lakes. A waterbird census covering most of the wetlands in Egypt including the River Nile was carried out from December 2017 to January 2018. It was the most comprehensive of its kind. Projects on integrated management of migratory waterbirds and sustainable bird hunting along the Egyptian Mediterranean coast have contributed significantly to the implementation of AEWA and Ramsar in the country. NCS also initiated long-term studies to investigate all the factors driving the bird hunting activities along the Mediterranean coast. Results of these studies will serve as a basis in the decision-making process to sustainably manage wetland resources and bird hunting. Bird hunting is one of main livelihoods of people living along the Mediterranean coast. Therefore, the socio-economic impact of the use of waterbirds at the Northern Delta Lakes is currently being investigated. The survey will investigate the impact of legal and illegal offtake on migratory waterbird populations. Earlier studies provided information on illegal hunting techniques and on the numbers of trapped and marketed waterbirds and seabirds. The data helped to confiscate all materials used for illegal trapping and hunting. Educational activities supported the measures and made a case for sustainable hunting. The Award is conferred every three years, at each ordinary session of the Meeting of the Parties and is presented in both institutional and individual categories: the Avian Ecologist of the Israel Nature and Parks Authority, Mr. Ohad Hatzofe, received the Conservation Award in the individual category. The AEWA Waterbird Conservation Award was established in 2005 by the Agreement’s Standing Committee to recognize and honour individuals, as well as government and non-government organizations and enterprises. Recipients should have made a significant contribution towards long-term conservation and sustainable use of waterbirds in the African-Eurasian region.